Christie Patricia Pearce was born June 24, 1975 in Ft. Lauderdale and grew up in the Jersey Shore town of Point Pleasant. A terrific all-around athlete, Christie excelled in youth sports and took it to another level while attending Point Pleasant Boro High in the early 1990s. She was a high-scoring guard for the Panthers basketball team and also starred for the soccer and field hockey teams. She led her conference in scoring in all three sports and was named NJ High School Athlete of the Year as a senior. Though recruited by several top colleges, Christie decided to stay close to home and became the star of the Monmouth University basketball squad. Monmouth was the only school that promised she could play other sports. In the fall of 1993, she began making headlines on the soccer field for Monmouth. Christie started all 80 games of her varsity soccer career and scored 79 goals. She was named Northeast Conference Player of the Year in 1995 and 1996 and led the Hawks to a pair of conference titles. She also established new single-season school records for goals and assists. Christie was also a quick, intelligent defensive player. In 1996, national coach Tony DiCicco invited Christie to train with the U.S. senior squad. He moved her to defense and she earned her first international cap a few months later in a 1997 match against Australia. She nailed down a starting job that spring and in 1998 helped the team go undefeated—included a gold medal at the Goodwill Games. The 1999 squad won the Women’s World Cup. Christie was a part of the 2000 Olympic team, which lost to Norway 3–2 in the gold medal final. In 2001, she married Chris Rampone and used that name on her uniform for several years. They had two children before divorcing in 2017. 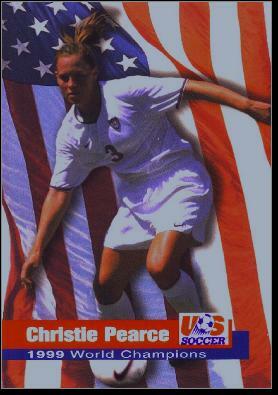 In 2002 and 2003, Christie missed playing time while recovering from a knee injury, but was part of the U.S. squad that lost 3–0 to Germany in the semis and had to settle for third place. In 2004, Christie was a big part of the team’s gold medal victory. Christie took time off in 2005 when she had her first child, Rylie. She was back in peak form for the 2007 Women’s World Cup, in which Team USA finished third. The following year she was named team captain and led the Americans to another Olympic gold medal. Three years later, while battling Lyme disease, she led Team USA to the 2011 Women’s World Cup. The team lost to Japan in the final in a shootout. Christie captained the team to another gold medal at the 2012 Olympics in London, avenging the loss to Japan with a 2–1 victory in the final. Christie saved a goal with a great defensive play in the game. During the 2015 World Cup, Christie became the oldest player ever to take the field in the tournament at age 40. Team USA won the tournament for the first time since 1999. In 2016, Christie withdrew from he national team camp and made her retirement official in early 2017. In all, she made 311 international appearances, won a pair of World Cups and collected four Olympic medals. Throughout her career, Christie played for pro teams, including the New York Power and Sky Blue FC, in New Jersey. In 2009, she was named Sportswoman of the Year in the first season of the Women’s Professional Soccer league. Christie played with Sky Blue FC in 2017 until assorted injuries ended her season in August.